English name: Crab apple (Himalayan). 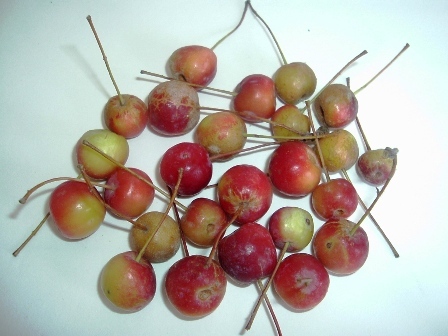 Palo is a crab apple found growing wild in the temperate Himalayas. It can be seen right from Kashmir to Jaintia hills in the Eastern Himalayas between an altitude of 1800 to 3000 m above msl. Trees small, round headed with short trunks, upto 14m high, armed with simple or branched spines when old. Leaves simple, tomentose or glabrous, serrulate, ovate 2-3inch, sharply toothed, and sometime long pointed. Flowers white or pink, 4 to 5 cm in diameter; borne on simple or compound, terminal corymbs; calyx tube bell shaped, adnate to the ovary, becoming enlarged and fleshy fruit, lobes 5, reflexed, persistent or falling off after flowering; petals 5, orbicular, shortly clawed; Stamens numerous, carpels enclosed within and adnate to calyx tube; styles 2-5, free to the base nearly so, stigma terminal, small. 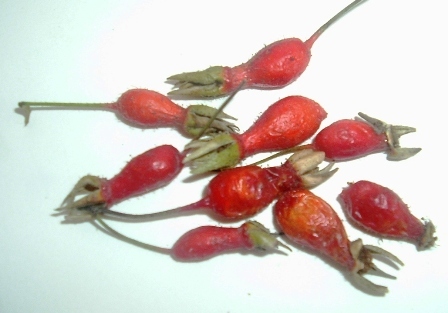 Fruits sub-globose,1-3 cm in diameter, fleshy, having 2-5 parchment like cells at the center, each containing 1-2 seeds or pips, red, scarlet or yellowish green with a few white spots, borne on long slender pedicels. Fruits are usually of small size, sub-acidic to sweet in taste with some astringency. The blooming season of palo varies with the climate. It may take place in March-April depending upon the altitude of the location. The fruits take long to ripen. These are ready for picking in October or November again depending upon the climate of the location. There is a big variation and size and quality of palo fruits. In size, the fruits can vary from the size of a rose hip to a small apple. Most trees, however, bear fruits which are slightly larger than cherries. Fruits are eaten by children and local people. They are also suitable for processing into jam, jellies and preserves. They have tart flavour and astringent taste before cooking. Some of these have apple flavour and are eaten in Lahaul valley of Himachal Pradesh. Palo is commonly used as a rootstock for apple. The strain of palo which grows in Shillong and Naga Hills of East India is resistant to color rot and apple woolly aphis.